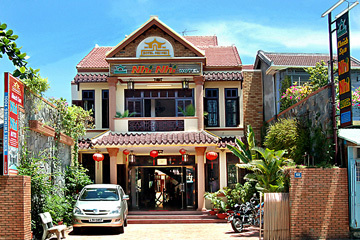 Nhi Nhi Hotel is a 3-star standard with facilities and services that conform to 3-star international standard. Its 24 well-appointed rooms, our hotel is tastefully decorated, fully funished and spacious to give you a feeling of tranquility and complete relaxation. - A swimming encompassed by row of room like sky well, sunshine streams through the window creates a feeling more comfortable, especially when sitting private balcony. - Our restaurant is serving delectable Vietnamese and continental cuisine to European and Asian cuisine. - Transport to airport and train station. Beautiful swimming pool with French technology. More attractive with blue colour and cool water.